Arrived at work this morning to be greeted by J and her lip. She had a ‘normal’ coldsore yesterday but this morning it was huge. Massive. She could *actually* see it herself! She couldn’t laugh without being in great pain, so me being the natural comedienne that I am, made her very uncomfortable and shortly after I arrived, she went home to bed. We are supposed to be going out tomorrow night. Work was uneventful. In fact today was pretty uneventful. Took a couple of photos for my blip foto while in the car park at the school run…. 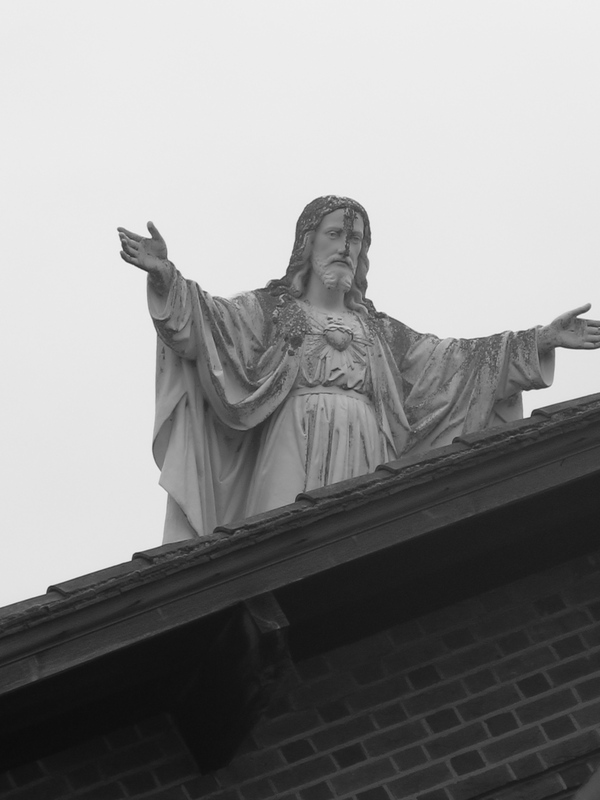 Yes, its a Catholic School, but someone needs to wipe JC’s forehead I think. It’s not very respectful is it? Took Beth to her dancing and as I had promised her Toad in the Hole, and Ellie had to be out of the house early evening for her school dance show, I ended up making three dinners…. Ellie had fish, Beth the aforementioned Toad in the Hole and as I don’t like it, I made myself pasta…. sometimes I’m either a good mum, or bloody stupid. Stu had been at an event in London for EA, with Rooney (short) and The Enemy (quite good, but look hairy). Checked on J and she said that the thing was now solid and scabby and she thought it could be viewed on Google Street Map (I doubt this but wasn’t going to argue) I have told her that alcohol will numb it and that I will, of course, tell her if she dribbles while drinking tomorrow night. I am very thoughtful like that. Watched Masterchef, dispersed with some Crufts and then a thing on Michelin Stars. But tomorrow is Friday! The weekend! My traditional blog day! Brace yourself readers, both of you, I’m going to make an effort to be entertaining and thought provoking. Oooh must dash am going to watch Question Time to research deep and measured topic for tomorrow’s blog. Love you. Night. Posted in Diary Entry and tagged TV. Bookmark the permalink.